Welcome to my New Forest Life Tales Issue #008 October 2011. A Tale of Two New Forest Fillies - being weaned and leaving their mums. 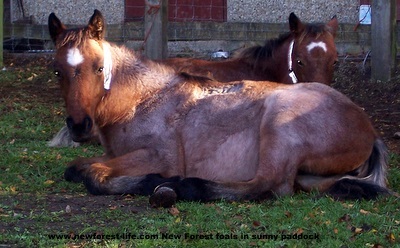 Most of the beautiful New Forest foals you see each year are born around May. By then the weather is hopefully kinder and so, if it becomes cold or very wet, they are not in danger of succumbing to chills or even pneumonia. This is a tale about 2 little filly foals I'm lucky enough to be involved with. I thought you might enjoy hearing about their lives and some of the centuries old New Forest customs. Jody and Jilly share the same stallion father. They both have similar colourings from a distance but close up their markings are different. New Forest ponies give birth out in the forest unless their owners are lucky enough to be able to get them in. This has been going on for centuries and mostly goes without a hitch. Once born and able to stand, which takes a matter of minutes, (but usually on very long and wobbly legs!) a newborn foal has to pass what is called a mecomium poo. This is usually black and is the aftermath of leaving the womb, but not yet suckling the rich mares milk. During the first few days the foals experience quite a lot of change. The mecomium is replaced by a yellowy running outflow because the mothers milk is rich in cholostrum just as in human infants. This is a vital start to life for them. I always find it funny when you walk around the New Forest where the foals have been - you see normal sized adult droppings and next to them tiny little perfectly formed but miniature foal droppings.They are like little dark nuggets of green jet. I wouldn't suggest you make a necklace though!! Unlike human babies the animal kingdom expects all newborn animals to be able to move and be aware of danger virtually as soon as they are born. New Forest foals born into the heathland heather and bracken are no different. They stay as close as possible to their mum and again it is lovely to see them moving together as one. A fascinating fact is the change that takes place in their little hooves. When they are born a half inch pre birth stripe is visible and then, when they are weaned, they get another stripe to show they are no longer dependent on milk. It's also lovely to see the little hoof prints all over the New Forest where they have left their mark. Jody and Jilly are lucky little fillies. They both have strong and healthy mothers who have looked after them well. At 4 months or more they are ready to be weaned. By now you sometimes see that mothers are getting a bit weary of motherhood. Little heads are thrust quite harshly onto mares whenever a feed is wanted and you can see teeth connect as well. Sometimes a mare will just push a foal away if she really is ready for the weaning process to start - who can blame her? Mares sometimes lose "condition" if they are producing a rich feed for their off spring. By 4 months feeding may be taking it out of them. You may see quite a "ribby" mare, i.e. you can actually see all her ribs and even perhaps a little bit of her backbone too. The foal is draining her and once weaned, the milk she continues to produce, can be absorbed back by her so that she soon becomes in better condition herself. Her milk production will start to dry up. The reabsorbtion also ensures that she will be fit enough to be able to face a harsh New Forest winter. Also, at this time of weaning, the mares may also be in foal again. The stallion will have been put out months before and "covered" as many mares as he could find. They were brought into a paddock with their mums and allowed to graze and also get used to having a "hard feed" which is a bucket of special feed made up of grains and hay. These lucky little ponies actually have a "hay hutch" so they can nibble hay whenever they want. Spoilt or what? Actually having access to hay in this way helps them to build strong digestive tracts for the future when they will be returned out onto the New Forest and have to forage for their own food. They will need to find enough to take them through all weathers and situations. It's quite a tough life being a New Forest pony. As you can see from the photos their coats are thick and woolly in the first year. They often change colour - sometimes completely. I've got photos of a few favourite little black foals who are now almost white - they are dappled greys and go through this amazing colour transformation. If you buy a pretty little black foal, make sure you check out its parents or you may end up with a different one entirely. Jody and Jilly have gone through the following transformations during the weaning weeks. They have had halters put on - Jody took great exception to this and sulked for days - you could see she was really furious - what a spirited little lady! 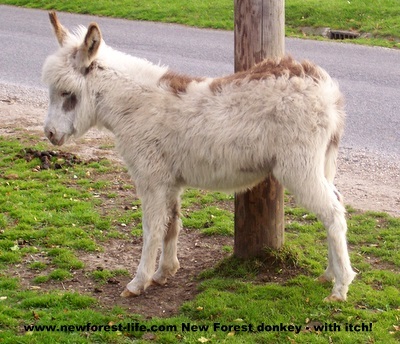 If they stay on the New Forest they must be included on the New Forest Register. They will also take part in the yearly New Forest Drift. If they're not yet branded they will be at this time. Fees must be paid by their Commoner owners to allow them to stay out on the New Forest. Jody and Jilly will keep their halters on until they are realeased back onto the New Forest. This is so they can get a little more used to being handled. When we needed to box up the roan mare and her foal last year because the little foal was suffering acorn poisoning and in very serious danger of dying, we needed to coax mum into the box with food and hope the foal would follow. A worrying time. If the foal had been more used to a halter we could have saved more time. Last week Jody and Jilly were branded. This isn't a painful process (if done by an expert!) but does involve shaving off a patch of really dense, thick foal coat and applying a branding iron to the exposed area. The only unpleasant part is the smell of singed hair! Branding is individual to each Commoner and helps the Agister to identify a New Forest pony - if they are injured on the roads or are ill out on the New Forest. Our little girls, Jody and Jilly, are becoming much more use to human beings and are easier to handle. There is often a bit of temper shown, usually squabbling over the pink feed bucket! and the odd hind leg or set of teeth nearly connect too! When you observe foals out on the New Forest the natural hierarchy is fascinating to see. A foal will always defer to an older animal - they do this by "mouthing". They push their heads forward, open their mouths really wide and do a chewing motion. You can see they always hope this act of submission works and if for some reason they have chosen to do it to the wrong pony, they then need to run like the wind to get out of the way! Again fascinating to watch. They are two very lucky little New Forest foals. They will be loved and nurtured by a caring and responsible New Forest Commoner. There is a back up team of "relatives" who will be looking out for them when they are back out on the New Forest. They may both chose to go back to their mothers herd and spend their lives roaming the New Forest with them or they may decide they will join a new herd and not see much of their mothers in their daily lives. Their little lives will be tough. They will be vulnerable to the elements. The New Forest pony needs to be tough. We hope they will stay away from the roads and keep themselves safe from the traffic and irresponsible drivers who kill so many New Forest animals each year (this year is already up on last years road death figures). They will have to find enough food to keep themselves strong and healthy and they must be careful when they encounter humans too. Visitors feeding, and irresponsible dog owners are always a danger to the New Forest animals. When we see them out on the New Forest we will feel a sense of love, joy and optimism that this little pair of New Forest fillies are now out in their big, new, world and living their own independent lives. We'll also have lots of wonderful memories of all the hard work that went into their little lives to allow them to be part of the fascinating New Forest ecology and the part they are playing in it. 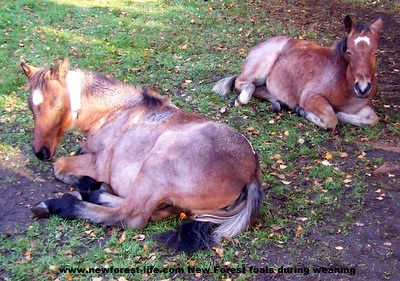 I hope you enjoy this latest New Forest Tale about these two little fillies. As they progress they may feature again in a future New Forest story that I can share with you.